Clutchlings: Chad Jenkins: End of the QEW Shuffle? The Blue Jays signed Gavin Floyd to a major league contract on Saturday, designating Swingman Chad Jenkins for assignment. -1st round compensation pick (for the loss of Marco Scutaro) James Paxton, who the Blue Jays were unable to sign. With the compensation pick they received the following year, they selected Noah Syndergaard, who went to the Mets in the R.A. Dickey deal. -3rd round comp pick (for the loss of free agent A.J. Burnett), they chose Jake Marisnick, who was part of the package sent to Florida in the Jose Reyes-Mark Buehrle deal. -5th round pick Ryan Schimpf has topped 20 Home Runs each of the past four minor league seasons, and has been a good MiLB depth piece. -19th rounder Ryan Tepara has a shot at a spot in long relief after making his MLB debut last year. Not an outstanding group (outside, potentially, of Syndergaard), but only the Braves and White Sox 2010 draft classes have produced more WAR as a group. A mid-80s guy in high school, Jenkins had a soft body but his arm worked well, and he has improved significantly in college. He had a strong sophomore season, first with Kennesaw State (5-5, 3.96), then in the Great Lakes League. Jenkins has firmed up his still soft body, and his velocity has caught up with his ability to throw strikes. He now has two or three plus pitches at times with good command, giving him serious helium. Jenkins has a great feel for pitching and now sits at 90-93 mph with his hard sinker and reaches back for 96 mph with a four-seamer at times. His sinker has boring action in on righthanded hitters when it's going well. His slider gives him a second plus pitch. His changeup is average. Jenkins repeats his delivery, and scouts see his big 6-foot-4, 225-pound body as a durable asset, particularly if he keeps getting in better shape. He resembles Phillies righthander Joe Blanton, with better command, and should go in the first 20 picks. By 2012, he had advanced to AA, and after a near-epidemic of injuries to the pitching staff, made his MLB debut in August, pitching decently in a relief role, before being given three starts at the end of the season. Injuries cost him a chunk of 2013, but he pitched well in 10 appearances (3 starts) with the team. 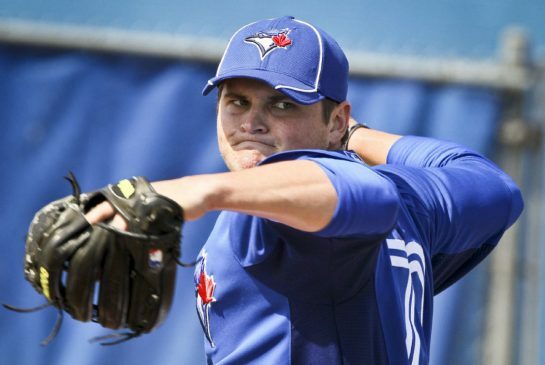 2014 again saw him spend a fair amount of time on the QEW, with 3 separate stints with the Jays, all in relief, but he put up decent numbers, only to have his season end when he was fractured his hand during batting practice in early September. 2015 saw him make all of two appearances with Toronto, seeming to be the beginning of the end of his time with the Blue Jays. The Blue Jays now have 10 days to trade Jenkins, place him on waivers, release him, or outright him to the minors. What went wrong for Jenkins? How did he wind up getting to know some of the Peace Bridge customs officials on both sides of the border on a first name basis? 2009 was the year, of course, the Blue Jays passed on a New Jersey High Schooler named Mike Trout, but then again, 23 other teams did too. The Nationals took San Diego St RHP Stephen Strasburg with the 1st overall pick, and newly acquired Blue Jay Drew Storen with the 10th, the Braves took P Shelby Miller with the pick before Jenkins, and the Twins took P Kyle Gibson. Garrett Richards was taken by the Angels with the 42nd pick. What I'm trying to suggest is that by the time the Blue Jays' turn to pick came around at 20, there wasn't a lot left in terms of upper-level talent, and Jenkins was as good a pick as any. Jenkins didn't experience a significant uptick in velocity when he moved to the bullpen, and he was sometimes a victim of a numbers game. With Liam Hendriks experiencing success in a long relief role with Toronto this year, Jenkins was the odd man out, which is unfortunate, because he may have benefitted from the improved infield defence the club fielded in the second half of the season. Jenkins profiles more as a tweener, someone who could start and relieve, but wasn't effective enough at either to have a more secure and defined role on a Major League roster. Even with the holes in Buffalo's rotation after last season, Jenkins was not considered to be a piece of that puzzle due to his option status. In the end, he was good, but not good enough. This morning, it was announced that Jenkins had indeed cleared waiviers, and was outrighted to Buffalo, meaning not much has changed, other than he no longer has a spot on the 40-man roster. His AAAA status is all but secure.